Wet Pants are a very moist and sometimes odorous artifact found in Godville. They resemble the pants normally worn by the common person except for the liquid dripping from them and the distinctive sound they make when dropped on the ground. They can be used as makeshift weapons by slapping them against the face of a monster, who will likely recoil in surprise and disgust. They are generally considered of historic importance. Although the common belief used to be that Wet Pants were the product of adverse weather or monster saliva, this was disproved after an intense investigation by the Godville Times when the trading market began to swell with knockoffs of these artifacts. Upon interrogation it was found that famous heroes had lied in order to escape embarrassment after Wet Pants were traced back to them. It is now a common belief among people that Wet Pants actually originate from heroes accidentally spilling drinks on themselves when fighting a very terrifying monster. This could also explain why so many Wet Pants knockoffs are found by heroes after visiting taverns and pubs. Due to the possibility of these artifacts being of historic value from an epic battle some traders will buy them for a handsome price. 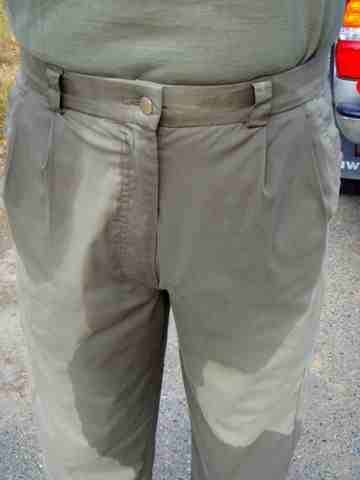 But even to this day opinions are still divided on their origin and many traders will outright refuse to buy Wet Pants, believing them to actually be the disturbing result of witchcraft or demonic influence. This page was last edited on 26 May 2015, at 20:29.